gthree.net - Kitchens & Baths COOKING & BATHING"Ron took the time to review our outline and spent hours through several meetings listening to our wants and needs for our kitchen project. Ron and his crew were friendly and respectful. Ron and his Crew get our highest recommendation. " Excerpted from a full page letter of recommendation from an extensive kitchen remodel. RESIDING IN THE HISTORIC SIBLEY-HOYT HOUSE, 1820 Et seq. 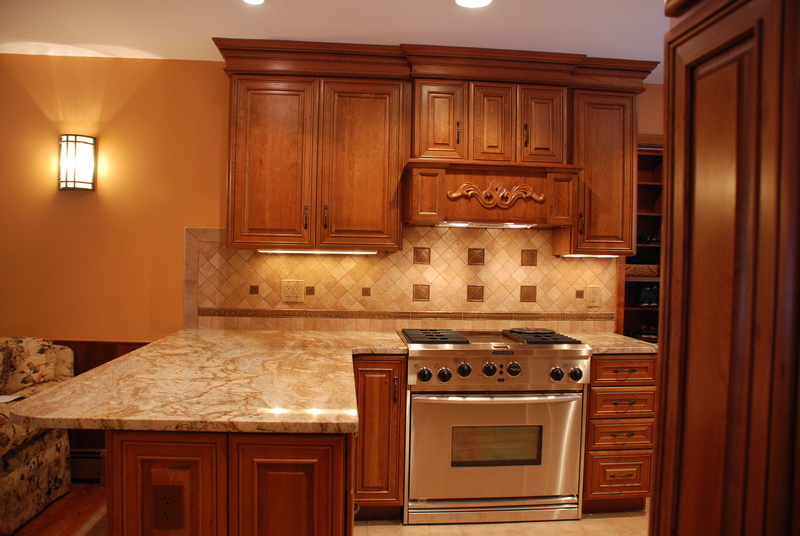 "Ron took the time to review our outline and spent hours through several meetings listening to our wants and needs for our kitchen project. Ron and his crew were friendly and respectful. Ron and his Crew get our highest recommendation. " Excerpted from a full page letter of recommendation from an extensive kitchen remodel. The kitchen is the center of the home. It's also where we go for sustenance, which includes conversation. 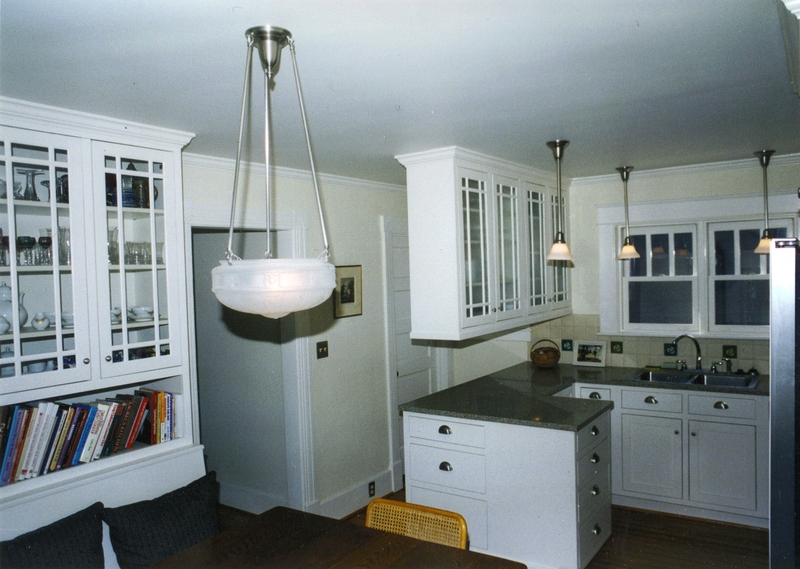 I have been designing and renovating kitchens since the mid 1980s. 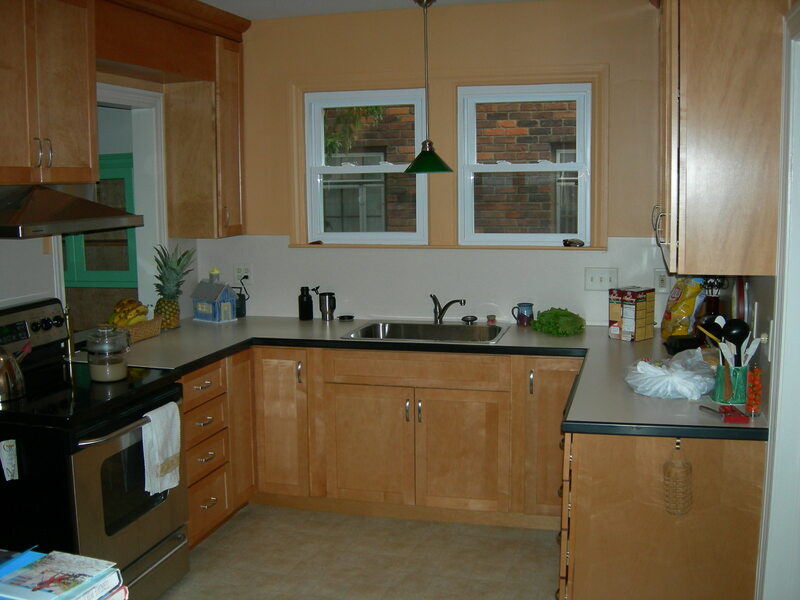 I have done very small, make-overs as well as larger, very custom, kitchens. I enjoy both. The renovation of a kitchen is the most demanding of home remodeling projects because, it contains the most amount of details, and the most potential for things going wrong. The kitchen is the most used portion of a home, which means that when something isn't done well, or properly, in the course of renovating, you will be reminded of it every single day, from morning to night. I pride myself in managing details, and most importantly, good design and floor plan. The stories I hear, and projects I see, that have been the least successful, are due to a combination of: poor design; poor floor plan and layout; poor execution; unqualified workers; one person trying to perform the job of several different trades people; Do-it-yourselfers, though well-intentioned, in the course of trying to save money actually wind up investing their money poorly in this major home project, by not being qualified for the job at hand. 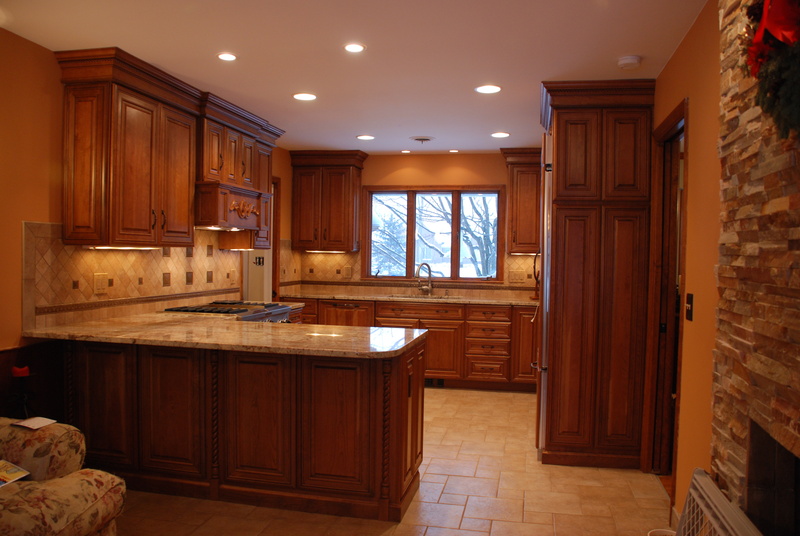 Aside from striving for the best results in design, layout and execution of workmanship, the other main focus is to get your kitchen back up and running as fast as possible. This requires experience, skilled coordination of selecting and ordering materials, good relationships with suppliers and trades people, and good scheduling and management skills. I will never start a kitchen before cabinets have arrived and been inventoried. I will not start a kitchen project before my schedule is open and I know I will not be distracted from completing the job on schedule, or ahead of schedule as allows. ABOVE: This kitchen is my design, my custom-built cabinets and oversight of everything from floor to ceiling in the kitchen and living room as well. It was a 100% environmentally friendly project. 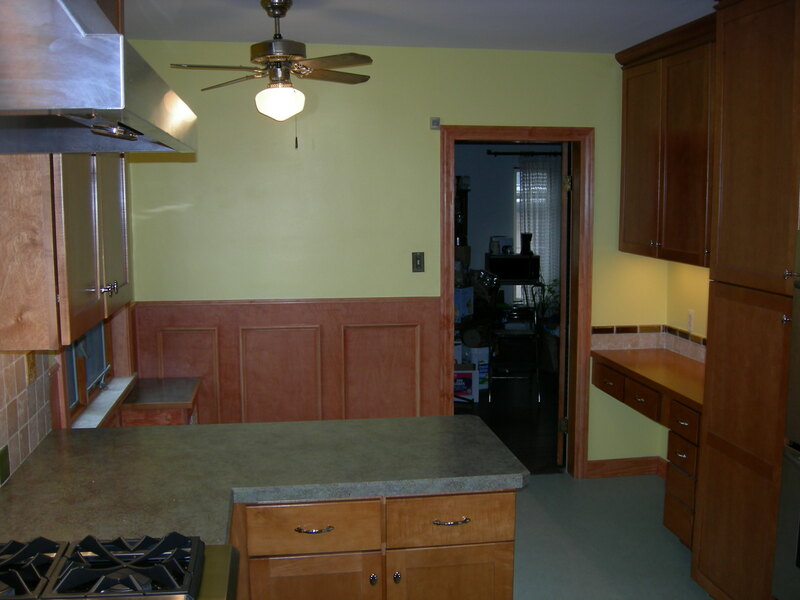 ABOVE: This is the before picture of a kitchen we made over in 2010 that included re-facing cabinets, new doors, counters, sink, appliances. BELOW: We replaced the very common oak doors, with mahogany nicely detailed paneled doors. 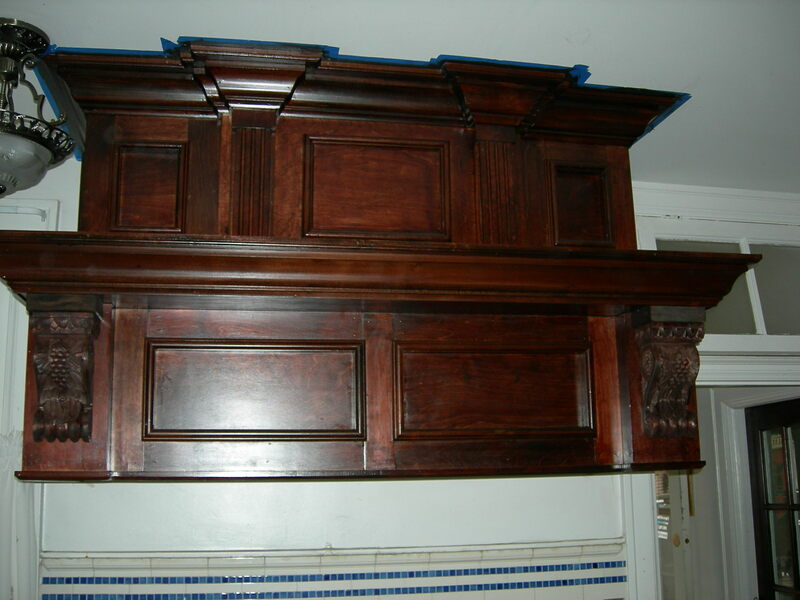 The cabinets have been recovered with mahogany veneers. The counters on the left are Corian brand solid surface while the island is a granite surface. 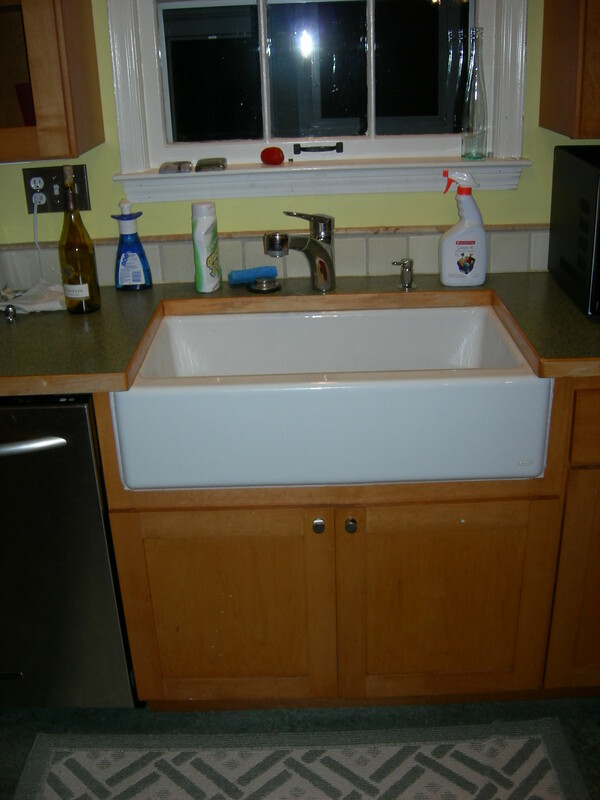 BELOW: Showing the integrated sink for kitchen above. 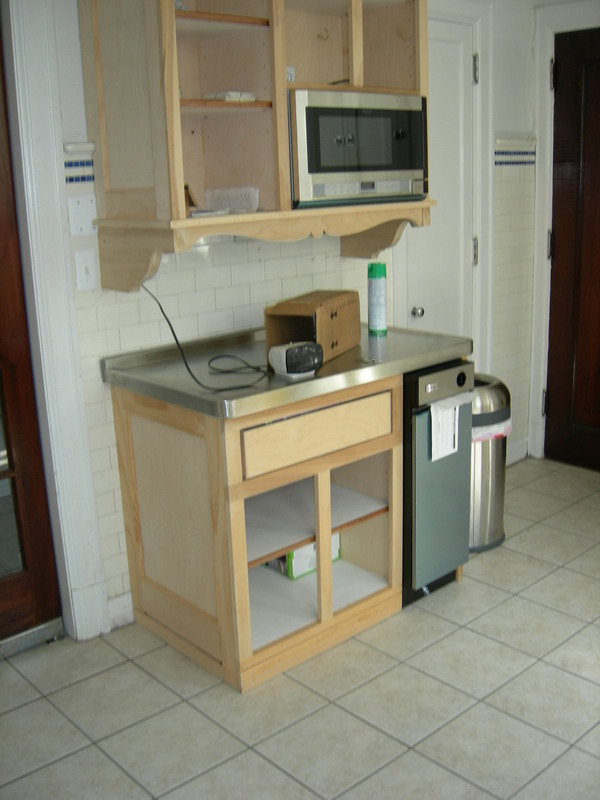 ABOVE: A simple white, thermafoil cabinet, with laminate counters and tile backsplash. 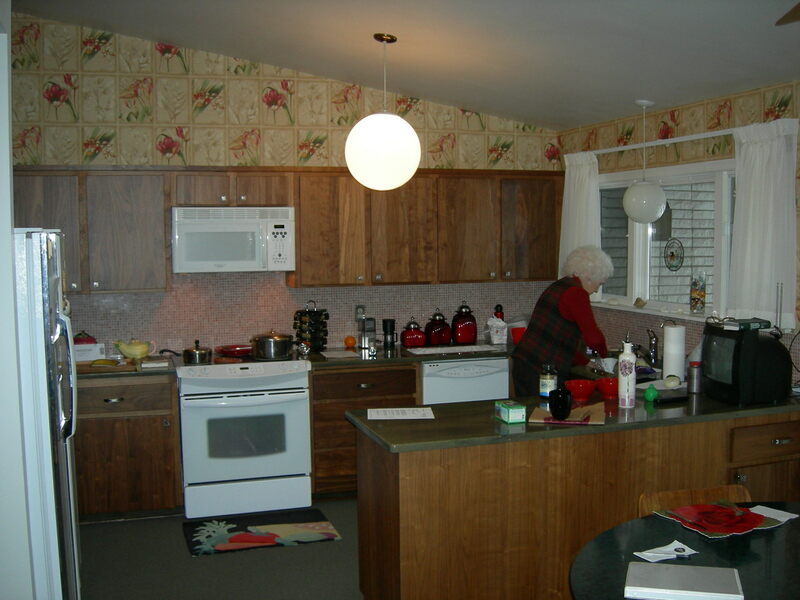 ABOVE: Linoleum floor, birch cabinets with glass doors, laminate counter with wood edge, farm sink. ABOVE: Recently completed kitchen with cherry, multi-piece doors and drawer fronts; four-piece cornice; decorative end panels on cabinet ends; color-coordinated electrical outlets, switches and cover plates. BELOW: Different view with custom range hood; granite counters, xenon under-cabinet lights; wall sconces. 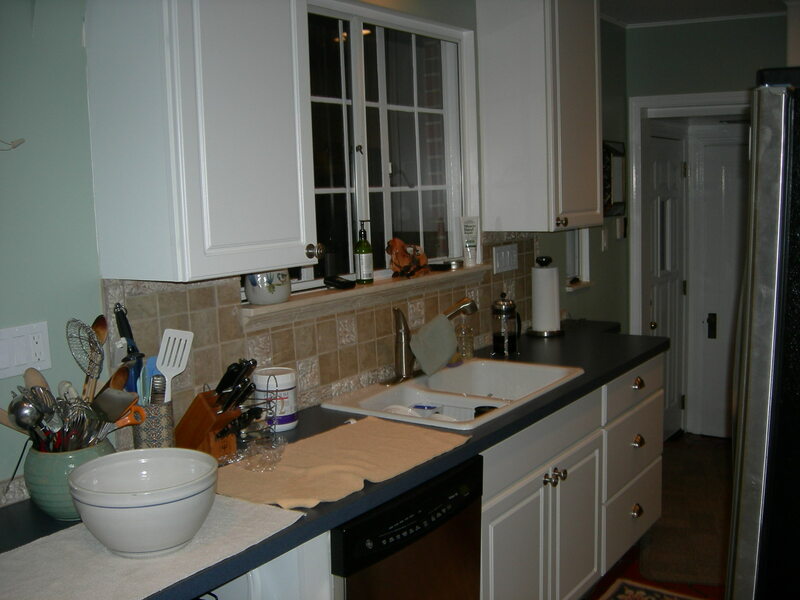 BELOW: Chronology of a kitchen renovation includes looking at the same wall in the three pictures below: before, during, after. 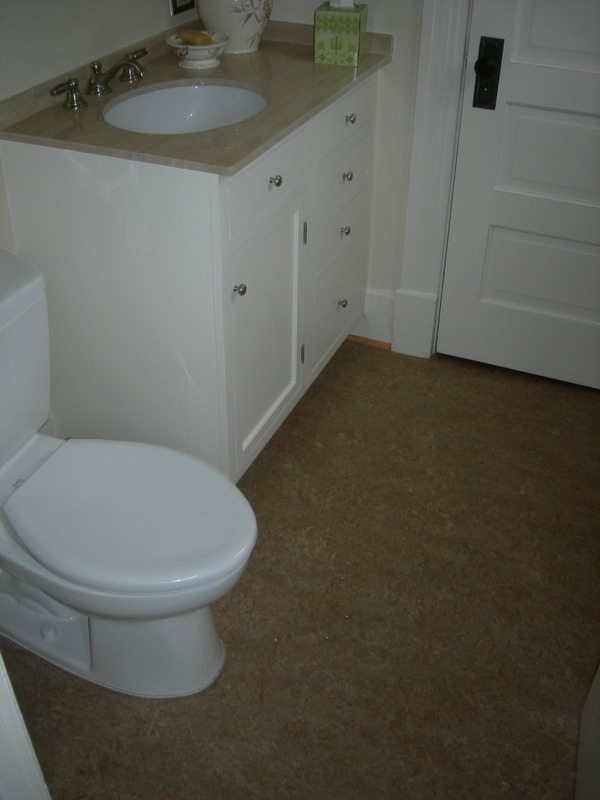 Next to the kitchen, the bathroom is the next most used portion of a home. 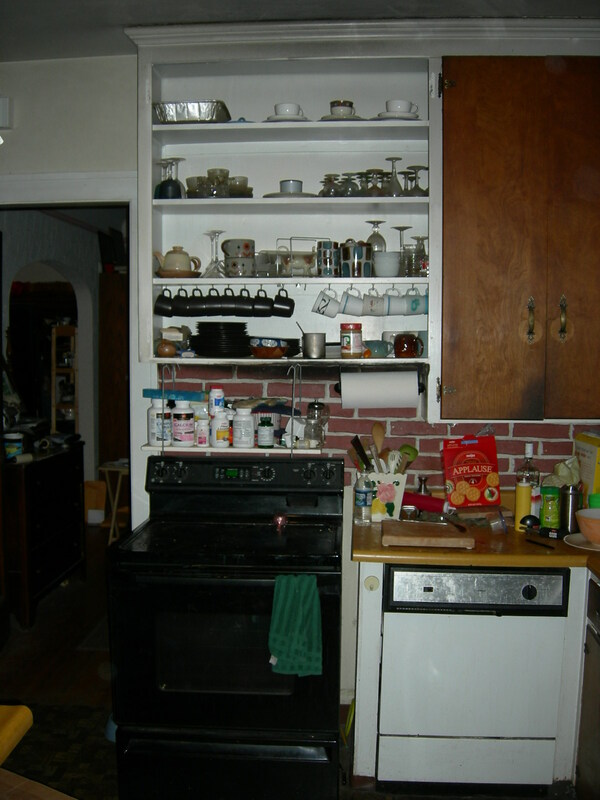 It also, like a kitchen, has lots going on in a small space. 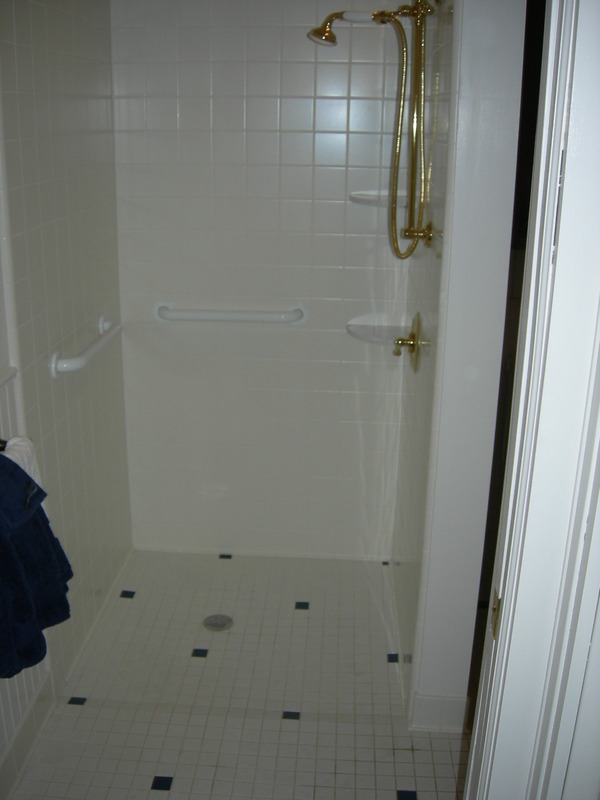 So, again, it is so important to make sure the person contracting the work to renovate a bath space is most qualified. Here are a few baths I have done. 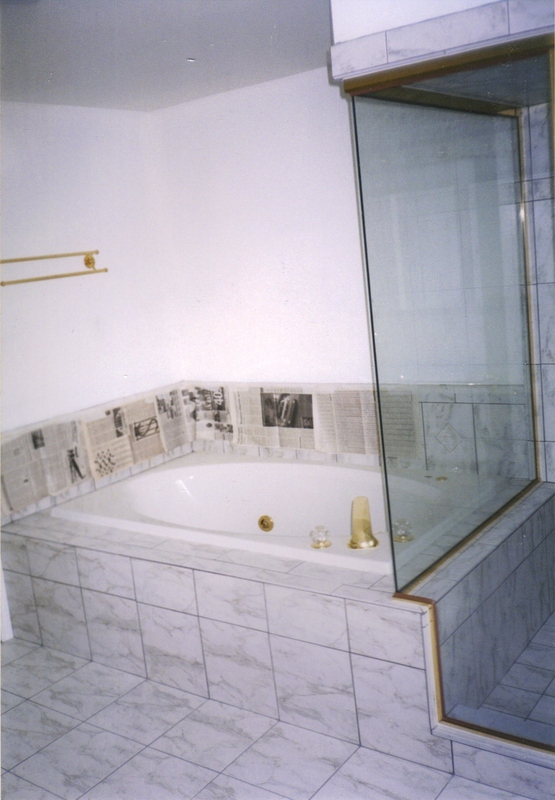 ABOVE: This all marble bath has a spa tub, steam bath, and shower. 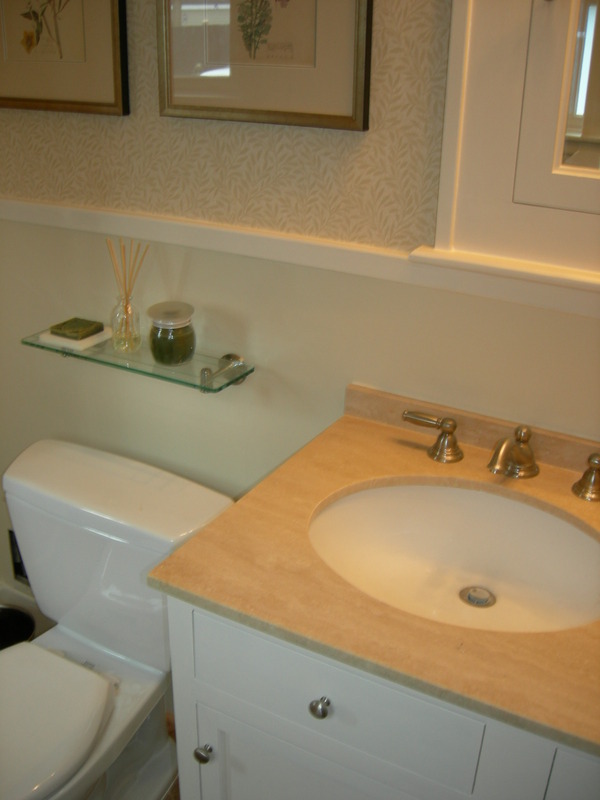 ABOVE: A craftsman house gets this new bath to more closely match the period of the house. True linoleum flooring. Cabinet doors and drawers are flush. 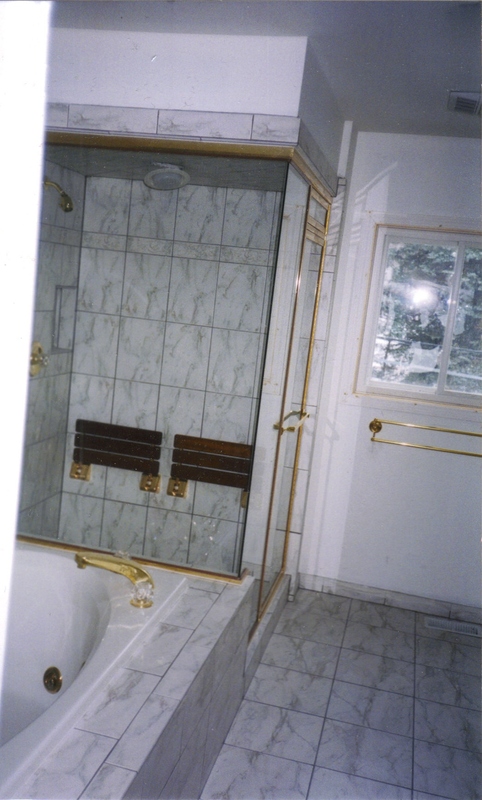 BELOW: Paneled walls, medicine chest of the period, marble top vanity. BELOW: This shower is barrier free. There is no curb. 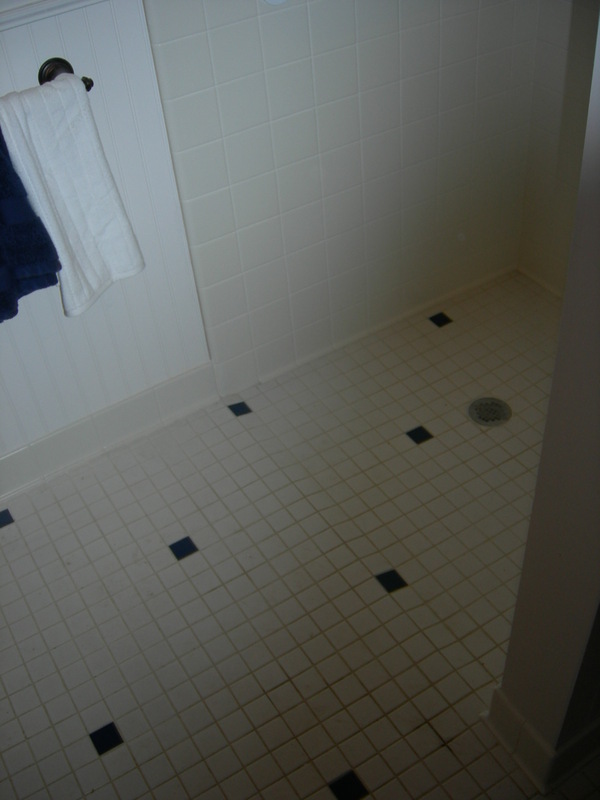 The picture below it shows the floor as it drops slightly into the shower floor area. BELOW: Custom window sill to match tile backsplash. BELOW: This kitchen has a Corian-type counter with a black band edge. It also has a range hood that vents directly outside, notice the wooden box over the pass-thru window where the vent pipe is located. 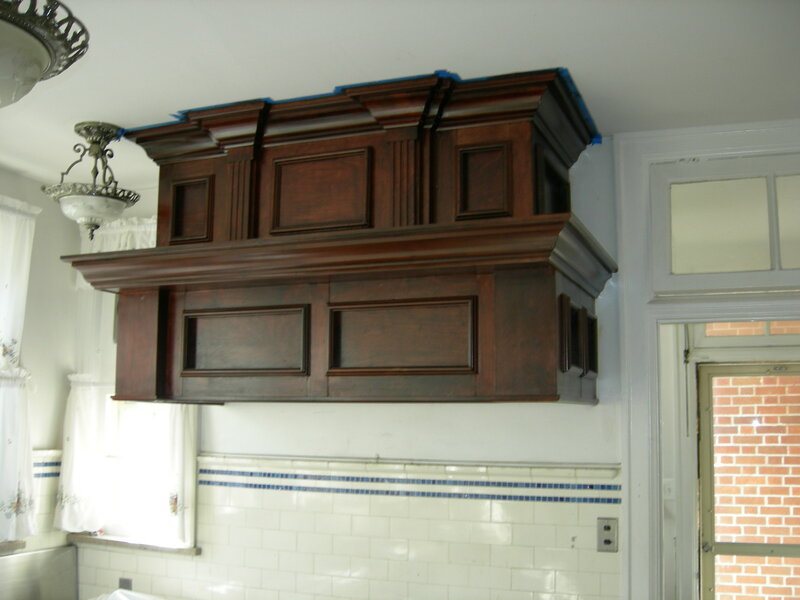 ABOVE: This range hood was a design the homeowner gave me to copy. It is so heavy it is held to the ceiling with chains. BELOW: Same hood after corbels installed. 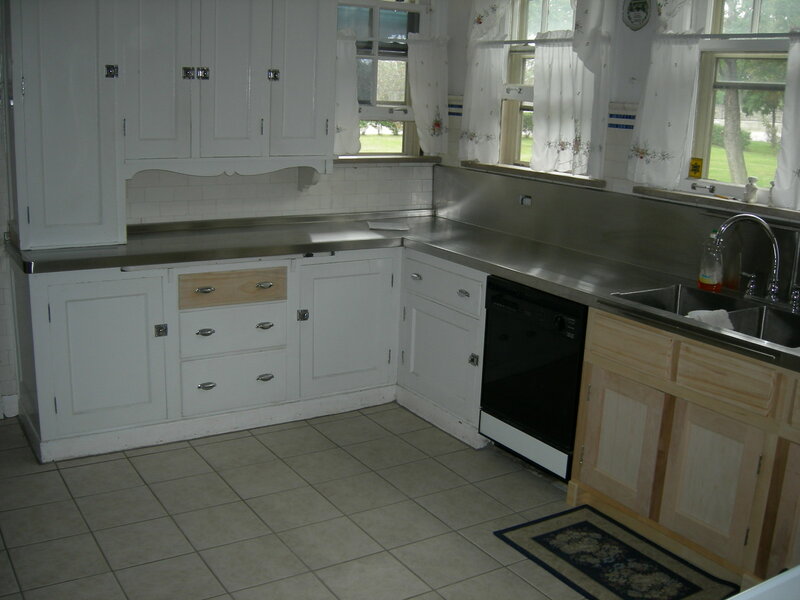 BELOW: This historic kitchen, 1917, had been changed by a previous owner. 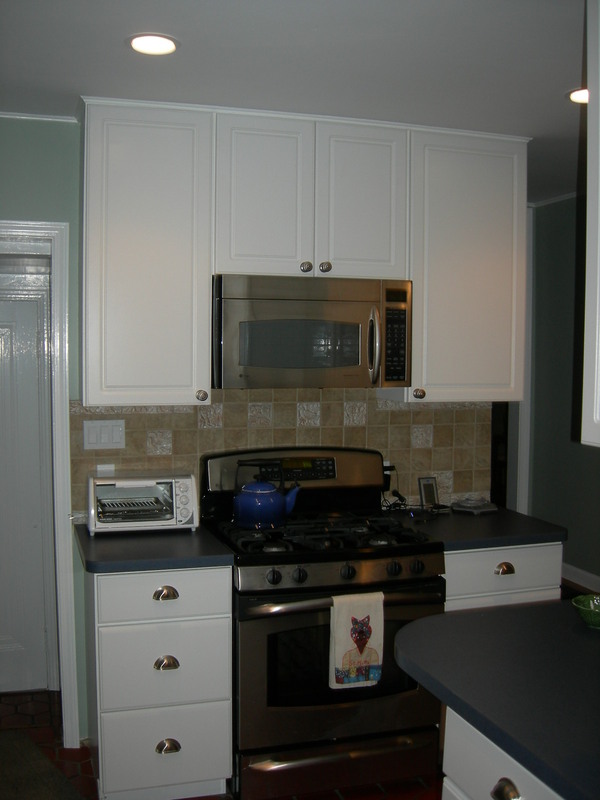 They had mixed in new cabinets that didn't match the old at all, and a laminate counter top. 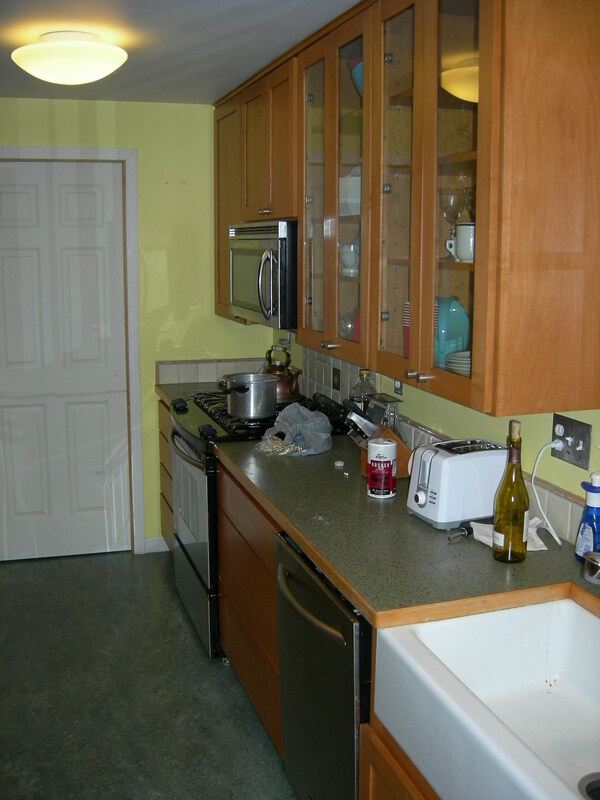 This picture shows the kitchen after I built new cabinets to replace the ones that didn't match, and a new stainless steel counter that was what was originally here. 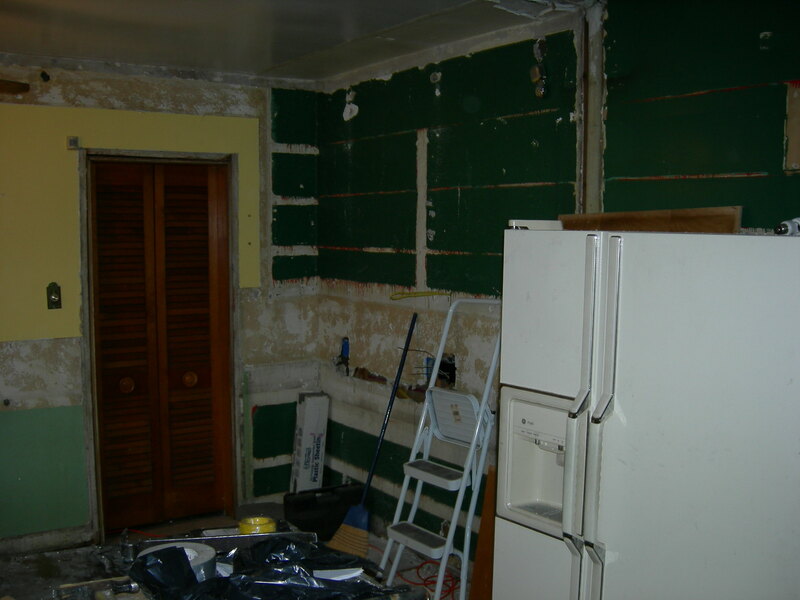 BELOW: Same kitchen, more custom cabinets, in progress, to match the old. BELOW: This is a kitchen make over that included removing all the old doors and drawer fronts, covering the old cabinets with walnut veneer, installing new walnut doors and drawer fronts. 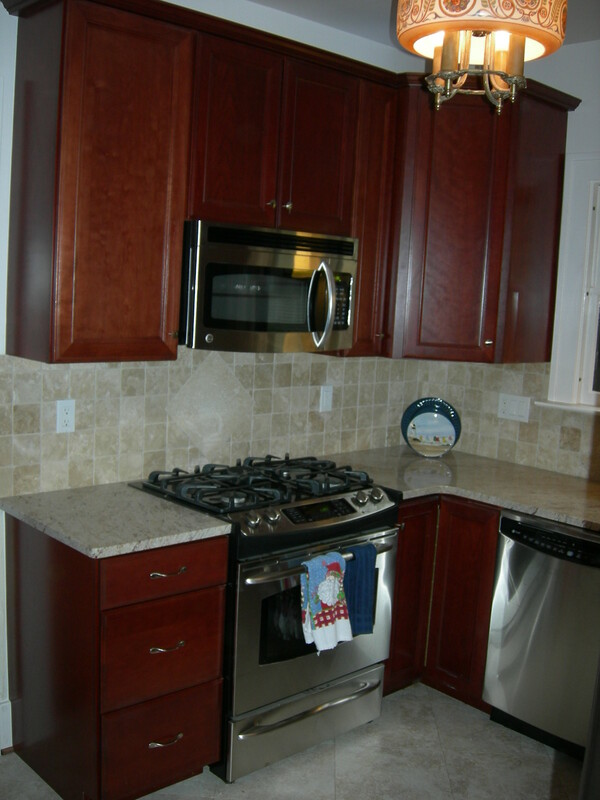 We also put in new granite counters, tile backsplash, wallpaper and paint. This is an example of an alternative to major expense and construction. 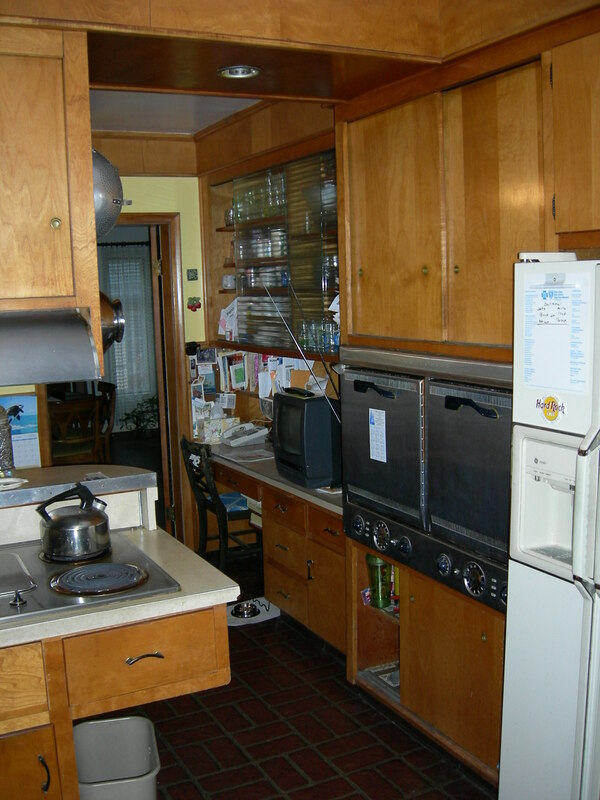 By re-using the original plywood cabinets, the kitchen looks new for a fourth the cost. 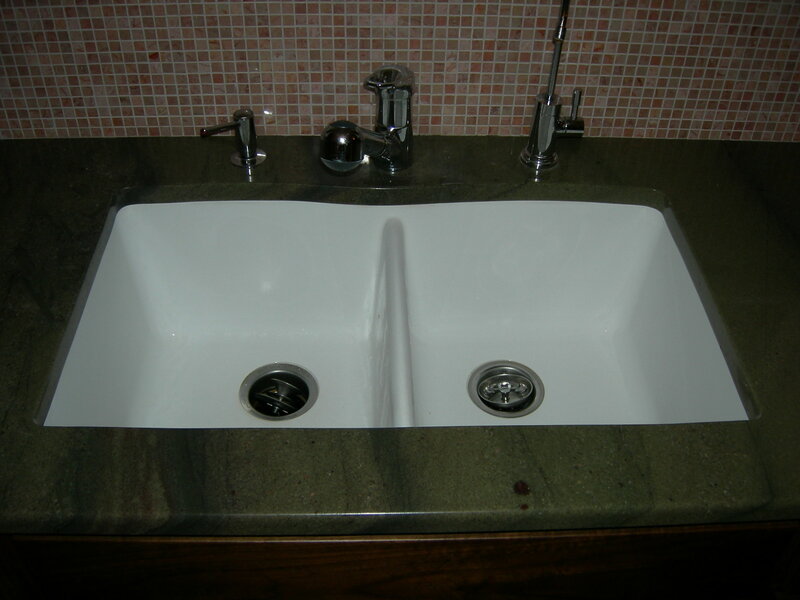 BELOW: This is a synthetic granite, undermount sink in the same kitchen as above. Copyright 2017 gthree.net. All rights reserved.